Two critics I admire, Walter Chaw and Bryant Frazer, are big fans of director Takeshi Kitano (known as “Beat” Takeshi when he acts). They make me wish I “got” Takeshi. Hana-Bi (a.k.a. Fireworks), praised by both as one of his best films, is pretty good . But there’s a huge gap between “pretty good” and “The best film of the 1990s,” and I’m not quite sure how to bridge that gap. Apparently, Zatoichi: The Blind Swordsman is not the right Takeshi movie to help. Both liked it, but neither loved it. Maybe I’m catching on, because that was my reaction as well. Zatoichi is not a new character. He has been featured in scores of movies and hundreds of TV episodes. Think James Bond and you might be close to finding the impact this folk figure has had on Japan. Zatoichi (“Blind Ichi”) is a blind masseur who travels from town to town. His cane hides a sword, and Zatoichi is fast and deadly with it. In each episode, he finds another reason to pull out the sword. Sometimes it’s to defend himself against those who would take advantage of the blind. Sometimes its to satisfy a young gun seeking to defeat the great Zatoichi. Sometimes, it’s to right a wrong. Beat Takeshi, facial tics and all, plays Zatoichi, who arrives in town at the same time as three other central characters. Gennosuke Hattori (Tadanobu Asano) is a ronin traveling with his wife, who is sick. O-Kinu and O-Sei (Yuuko Daike and Daigorô Tachibana) are twins looking for revenge. Their family was killed 10 years ago, and they’re hunting down the murderers, one by one. Although O-Sei is her brother, both travel as concubines on their search for revenge. The town they arrive in is run by three bosses, and each boss would like to eliminate the other two (but no, Zatoichi is not another Yojimbo/Fistful of Dollars). 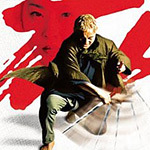 Zatoichi is an observer to all the plot threads, occasionally getting sucked into one or the other long enough for a (badly) computer-generated swordfight. So much happens with so many different characters that it’s hard to keep it all straight. I had to see the movie a second time to understand everything, only to realize that the movie isn’t really about the plot after all. Instead, it’s a vaudeville of entertainment, of which revenge and swordsmanship are only two of the acts. The film finds comic relief in two characters at the house where Zatoichi lodges. One is the hostess’ nephew, a gambler with the world’s worst luck. The other is the retarded neighbor who charges in circles, screaming, wearing underwear, a samurai helmet, and a dangerous-looking spear. 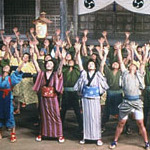 And as if comedy, revenge, and swordfights were not enough, Zatoichi also features the most unexpected credit in any recent movie: “Tap-Dance Sequences By The Stripes.” They set the rhythm of the film every 20 minutes or so as peasants and laborers who hoe, splash, saw, and hammer to catchy and intricate rhythms. They also provide the big production number at the end where the entire cast (except for Beat) gives a tap-dancing curtain call. Zatoichi is a lively, entertaining movie. The musical number at the end leaves you smiling and tapping your feet. But Zatoichi is a “best of” collection. Its scenes are hits and singles, but the whole movie is not an album. It’s entertaining, but not substantive. And I remain in the dark as to the superlative talents of Takeshi Kitano.